Kogo in Slovanský dům was once one of our favorite restaurants. Eight years ago, we were there just about every week. We still like it once in a while, but these days, it's just too expensive to be a regular habit. 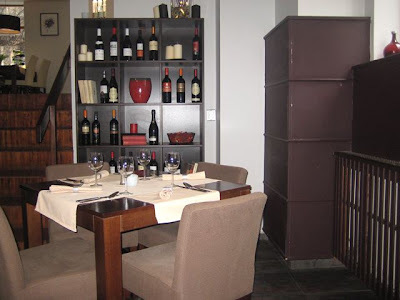 Our current favorite is Osteria da Clara. 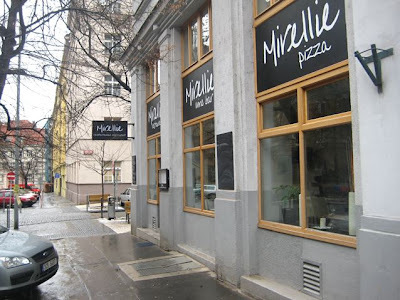 Last week, a colleague told me about a new Mediterranean place in Dejvice, called Mirellie. The guy lived in Italy for many years. Now, he lives across the street from the restaurant. He's happy with his new neighbor. As if this information wasn't enough to entice me, he added that former Kogo people were working there. And it was not expensive. We invited a couple of friends to join us -- Jersey Girl and J.
Mirellie took over the space vacated by Monsoon, an Asian restaurant I always wanted to try but never did. To be honest, the high prices put me off. The style of Mirellie's two dining areas reminded me a little of Kogo's café in Slovanský dům and their other restaurant, L'Angolo by Kogo. The rooms are filled with browns and beiges, familiar cylindrical lamp shades, and dark wood floors. Some of the furniture was held over from Monsoon -- but it was nice stuff. Very comfortable chairs. A former Kogo waiter knew us as regulars from back in the day. We got a big smile. Or maybe V did. She asked him if there was a connection between the restaurants, but he said no. They were on their own. We started with a few of beers. They don't have the greatest options. We had .3 liter glasses of Krušovice Mušketýr (30 CZK). The stemmed, gold-rimmed glasses were classy, but like Kogo, they don't have larger ones. The only other beers offered are Heineken (40 CZK) and Claustahler (45 CZK). We got a basket of focaccia -- actually pizza bread with olive oil, salt, and herbs -- fresh from the oven. It was nice. If you want really heavenly, warm focaccia before a meal, try Osteria's. For a starter, I had the chef's tuna tartare (165 CZK). For the money, there was a serious mound of fish. It was cut into small cubes, which sat on rucola leaves. 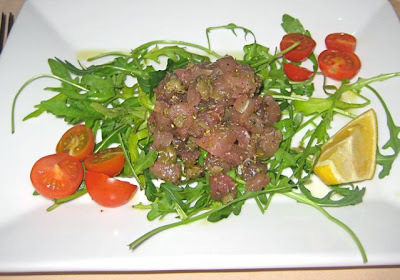 The tuna was very nicely marinated in olive oil and lemon, with cracked pepper and capers. The cherry tomatoes were bursting with flavor. Excellent. 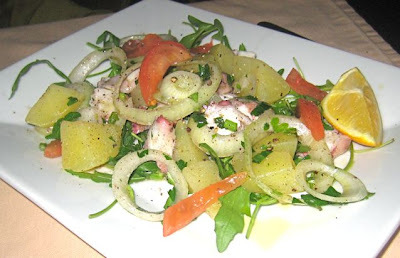 V ordered the octopus salad with parsley potatoes (155 CZK). The sliced-up suckers were cold and fresh. The potatoes, mixed with raw onion, rucola, and tomatoes, had a light soaking in vinegar for added flavor. V thought the potatoes could have been cooked a little more. 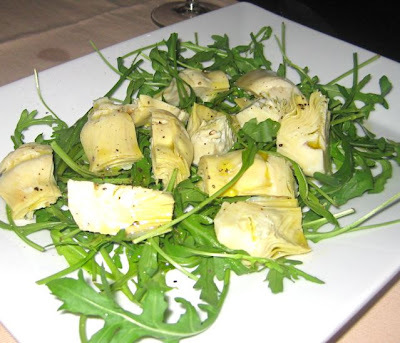 Jersey Girl went for the rucola and artichoke salad (130 CZK). Pretty basic. Great if you are into artichokes. Not a lot more I can say. J got a bowl of the fish soup (90 CZK). He called it "hearty" and "well-stocked with fish." There were also a few mussels thrown in. He said he liked it, but thought it could use a little more pepper. The other soups were only 50-60 CZK. 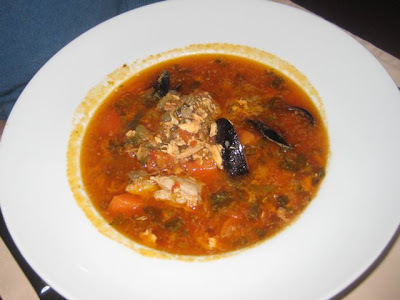 D, an Internet foodie friend wrote me to say that he really liked the Minestrone. He added that he thought they should use a better bread for the bruschetta. But overall, he was pleased with the place. We decided to share some red wine and ordered a bottle of 2005 Rinaldone dell'Osa, a Morellino de Scansano, which comes from southern Tuscany (460 CZK). Yes, we had red with seafood. It was a dry, crisp little wine. Nothing to write home about, but we all enjoyed it. 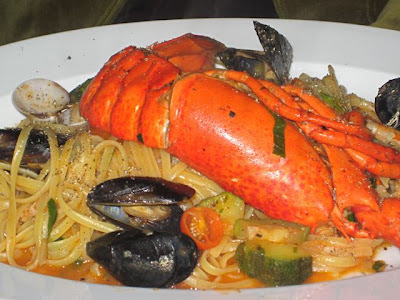 For a main course, V got her Kogo favorite -- linguine with half a lobster, shrimp, mussels and zucchini (245 CZK). She liked it just as much as the Kogo version. The biggest difference? Kogo's costs 490 CZK. The linguine was quite flavorful. On the other hand, I had a bite of the lobster's claw and thought it was over-cooked -- a problem often found in Kogo's lobster. V assured me the tail, which she did not share, was much better. 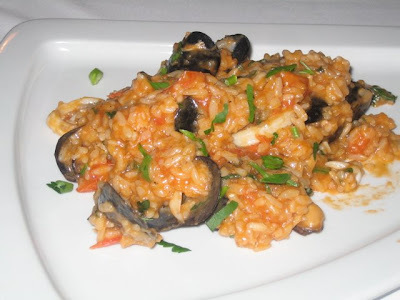 I did something similar to V -- ordering my Kogo favorite -- risotto ai frutti di mare (185 CZK). It was a big, filling portion. It looked very similar to the one from across town. 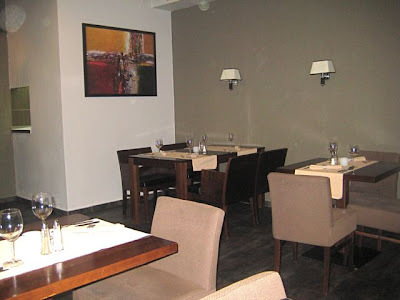 But I have to say Kogo's (295 CZK) is usually much better. Mirellie's didn't have the right, chewy consistency of proper risotto. Unfortunately, the bands of calamari were too chewy, and the shrimp were on the tough side. Overcooked. The mussel shells were a reasonable size, but the meat within was microscopic. I wished for more fresh parsely. In summary, I'll try something else next time. 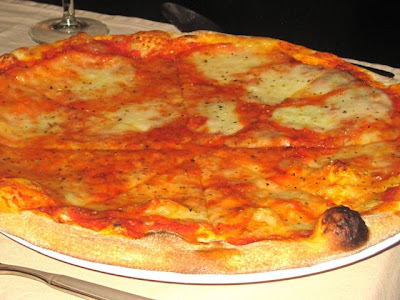 Jersey Girl had a Margherita pizza (99 CZK). She liked it, but said a recent trip to Naples lowered her opinion of every other pizza on the planet. She was dreaming of the thinner, crispier, more ethereal crusts. I had a slice toward the end of the meal. For me, sauce is a key factor in pizza appreciation, and this one was good. And there was lots of it. Well-seasoned, if a bit salty. Unfortunately, after sitting a while on the table, the slice had lost all crispness. JG assured me it was much better right after it arrived fresh from the oven. 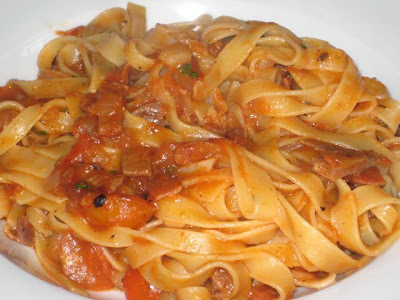 J ordered the tagliatelle alla matriciana (145 CZK). He enjoyed it but was surprised by its spicy kick. The menu does say it has chili peppers. According to my research, black or chili pepper is not part of the classic recipe, but can be added according to personal taste. We were all too full for dessert. The meal ended coffee and then complimentary glasses of limoncello came to our table. Service was impeccable throughout. Very friendly. Very efficient. It may well have been because the waiter knew us. It did feel like seeing an old friend. So, I can't say if others will have the same experience, service-wise. The meal wasn't perfect, but on the value for money side, it's hard to beat. J even said he's going to replace Aromi with Mirellie as his favorite Italian dining spot. That's quite an endorsement, considering he lives walking distance to Aromi. We'll be back, as well. V is in Prague 6 quite often, and it would be a great place to stop for lunch. 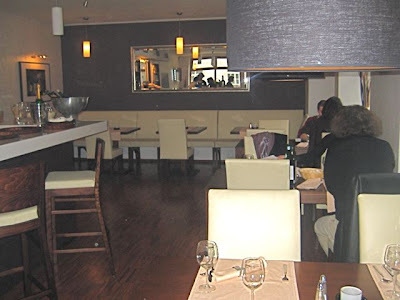 Yes, Mirellie appears to judiciously borrow quite a lot from Kogo in terms of modern style, and Mediterranean cooking. But Mirellie's prices are more like Kogo's circa 2001. Imitating all that in 2009 makes this restaurant something of an original. Glad you liked the furniture. My wife helped the previous owners choose it, and she also got the carpenter to build the benches on the wall of the first room. This has to be one of the most frustrating things about going to restaurants in Prague. You read the menu and you are thrilled, you read the wine list and you thing, "oo-er missus", you read the beer list and you think "oh god not that crap again". When will restauranteurs here start thinking outside the box and take as much care with beer as they clealy do with food, wine and presentation. Thanks for this, Brewsta. It's in my neighborhood and I didn't even know it was there! I'll have to check it out sometime. I like to follow your weblog and after reading this article we went yesterday to Mirellie. I should have read your article better. I took the mixed fish starter. And the mussels were completely overcooked. While it is so simple to prepare them. The pastas we had were very nice. Next time you have to try the deserts. We found them very good. No starters for us next time. Like you wrote, the service was good and efficient. Only on the bill they wrote Heineken beer, while I ordered Krusovice. They appologized and said it was error. Well, I have always my doubts about these errors. I stopped by Mirellie with a friend last Saturday. We sat on the top level of the restaurant rather than the subterranean level, as it was a lovely sunny day and we wanted to take advantage of the large windows filtering in light to the dining room. The inside was quite nice, being fresh, bright, and inviting. Some "Simply Red" played in the background, adding a nice touch to the relaxing, but refined atmosphere of the place. My friend ordered a Bruschetta appetizer, which I took a sample of. It was quite nice and simple in the way that it should be, with some tasty olive oil and fresh arugula and tomatoes. My friend, who lived in Italy for several years, mentioned that they left the pieces of tomato larger than the diced tomatoes that they do in Italy, but it tasted good anyways so we were happy. We decided to split a Salami pizza and a bowl of Penne alla Arrabiata. The pizza was good, certainly a step up over most Czech places, as they used lots of Mozzarella and a nice sweet sauce. 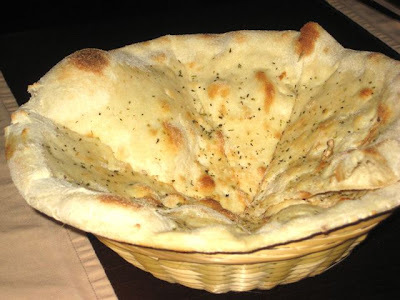 The crust was chewy in the middle and crispy on the outside, which we enjoyed very much. We waited a good 20 minutes between courses, as did the rest of the diners by the look of things. Sadly, the Penne was a disaster. First and foremost, they overcooked the pasta, leaving it with a mushy texture and a watery flavor. This is a cardinal sin in an Italian restaurant (or any restaurant charging money for pasta), so I was quite disappointed. The sauce was lacking salt, didn't have much kick to it, and strangely had a somewhat old, meaty flavor to it. I had to season it myself with salt, freshly cracked pepper, and a pile of Parmesan cheese in order to bring it to life. The whole dish was off putting and reminded me why I don't usually eat pasta out. Its almost always overpriced and not as good as what you can make at home in 20 minutes with a few basic ingredients. My friend and I chatted for several minutes after the food was cleared when she mentioned that she wanted coffee. The waiter walked by several times, with us politely trying to grab his attention each time. Finally I just got up and asked a waiter stationed behind the bar if we could get a Cappuccino. The bill came to about 600kc, which is reasonable enough considering we had three courses and a few beverages, and that the setting was certainly above most restaurants in Prague, but considering that we paid that for what amounted to well executed toasted bread and a nice salami pizza, we were a bit underwhelmed by the whole experience. I'd give it another try, just because it has a nice atmosphere, but if they don't nail the food the next time I probably won't return again.